I am trying to research my Italian side of the tree. As the story has been told, my g.g.grandfather was born in Italy (?) and as an infant went to England with his parents, (siblings ?) Shortly after they came to Canada. His name is Minotti Cassini. Any document I have found have his name spelled as Mennotti. This could be correct but I think it is the "i" pronunciation in Italian. The earliest record I have is his marriage registration 9 July 1875 in Port Credit Ontario Canada. His fathers name may be spelled wrong as the penmanship is difficult to read but here goes ..Riccitti Cassini and mother Carlotta. He married Susan Wilcox. Hi Cito and welcome to the forum. 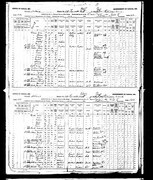 I have found an 1880 USA census with him, wife Susan and two of their children. Estimated birth year would be about 1845 but possibly earlier. 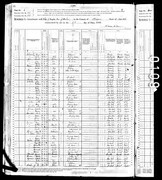 I'm also attaching the 1910 USA census for members to look at.............these might provide additional clues for members to assist you. Thank you for such a quick response. 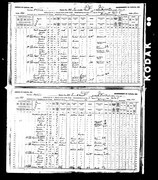 I have a copy of the 1880 US census. James is my g.grandfather. James had 2 marriages and 3 children. A son by the second marriage had an orchestra in Toronto, I believe it would have been in the 1930's. It was called the Loren Cassina Orchestra and I have photos of him with Rudy Vallee and Guy Lombardo. I would love to get my hands on one of his recordings. It is so facinating what you can find out with a little perserverance. I just cannot find anything out about how,when Minotti came to Canada. I have seen this website over the last year but was hesitant to join as I feel I do not have sufficiant information to get anywhere. You have given me hope. I have the feeling Minotti must have passed away in the Detroit area. Hi Cito can you post the image of Menotti's marriage certificate? Many of the people helping out on the forum are from Italy and they may be able to tell you what Menotti's name and his father's names are/could be. That might get us going in the right direction. Here goes. I am not very savvy on the computer. I only got one for this genealogy journey. Usually attachments don't work for me. The name Menotti was given to the first son of Giuseppe Garibaldi. This name was after the Risorgimento martyr Ciro Menotti. The fourth son of Giuseppe Garibaldi was named Ricciotti after another martyr Nicola Ricciotti. Actually both names, Menotti and Ricciotti, are family names but Garibaldi used them as first names to commemorate those two heroes. So I guess that other people took the habit to name children in the same way. The family name Cassini it's spread all over Italy. There is a concentration in Liguria region, particularly in Imperia province and some famous Cassinis come from that area. Great information Ada thank you so much. Cito if you would like to email me the images you have I would be happy to post them so other members can get a better look and assist you. You can email them to me at ejffts @ gmail.com (no spaces before and after the @ symbol). Thank you. Also on the marriage registration it looks as if the first name of Ricciotti is Wm. I believe that in Italian ,Giuseppe translates to William. Menotti's first grandson was named William Menotti Cassina. He is my grandfather. Eventually tidbits of information put the pieces together and makes things more understanding. I cannot believe that three copies got attached, I did explain I was not too computer savvy. I thought it wasn't working. No, William in Italian is Guglielmo while Giuseppe is Joseph or Joe. It's hard to read the document. I tried to enlarge it but it became blurry. Any chances to know what was Carlotta's maiden name? I have been poking around and on the marriage certificate there is no maiden name for Carlotta. All that is listed is Mennotti (later found on a census as Moses) and Susan Zeppora Wilcox. They were married on 9 Jun 175 in Port Credit Ontario, the children of William Riccotti and Carlotta Cassini and Henry and Whilemina (later found on a census as Phebe) Wilcox. Susan Zeppora (Zephora) Wilcox was born 3 Jun 1858 in Toronto to Henry, born 1811 from England. He was a sailor. And Whiliminia (Phebe) Gunn born abt 1819 in the US. Jessie born abt 1879 - marriage certicifcate states she was born in Youngstown NY - married Thomas Truman Johnson on 27 Jan 1896 in Oxford, Ontario. Ada born abt 1881 in Niagara Falls Ontario, married George Frederick Dare on 29 Nov 1899 in York (Toronto). and Minnie born about 1902. Mennotti made a trip to Columbus Ohio and then ended up in Detroit with his son. Pheobe and Minnie went to see sister Jessie in 1909 and ended up living with their dad and brother, Jon in Detroit in 1910. As you get to the US census it states Mennotti birthplace as England but earlier records do show Italy. It says he immigrated in 1896 which can't be correct since he married Susan in 1875. At this point I haven't figured out where in Italy he was born - still trying to place him on a English Census if possible. Just a note re Susan Wilcox. On her marriage certificate it states father James Wilcox and mother Phoebe Myers. On Phoebe's death certificate it states she was from Ohio. Phoebe and James had a son born Henry Horatio, in 1851, Ohio,USA. On a few census it states Phoebe as being born in the USA. I am not sure of the spelling either as I have seen it spelled as Miers also. I do not know who Henry and Whilemina are. As for Menotti, I have seen place of birth England and Italy. I just know that my Mom said that as far as she knew he was born in Italy and then the family went to England while he was young, and then off to N.A. My Mom has passed away and there are no seniors left for me to ask. I am the senior of this family. p.s.You said Brock Ave was in your area. When I wet to Toronto last year I went to the Archive Library as on the 1902 city directory it gave Menotti's address as 80 Dundas St. but the library clerk said in 1902 that was not the Dundas St. of today. She found out with the renaming (1917)that 80 Dundas St is now the corner Ossington Ave./Humbert St. Just another wrench! Cito - You're right. I was looking at the witnesses names - Henry and Whilimina! Could have been her brother then. Sorry. Could that have been why Menotti visited Ohio before? And Brock Avenue is not far from Dundas St. West. I see where you said Menotti went to Ohio, but I did not have any of that information, so I can't comment. I know that his second child Jessie, was on the 1880 census for Youngstown, N.Y with her parents and brother James. She was only 3 mo. old. I saw on a record but cannot put my fingers on it at the moment, that said she was born in Youngstown. But, another person researching the same family on ancestry. has her birthplace as Youngstown,Ohio. Again I cannot confirm that either. Hopefully one day I will be able to do that. I also cannot get the copy of the 1891 census. I am anxious to see that. Do you know how his name was spelled on that census? I will go on the website collectionscanada to try and find it.